How Does Smoking Affect Bodybuilding? Today it seems like everyone knows that smoking is detrimental to your health. It negatively impacts blood pressure, respiration, heart rate and even athletic performance. When it comes to smoking and bodybuilding, there is a noticeable negative impact to your results. If you’re a smoker, you can’t push yourself to the limits in a workout as well as a non-smoker can. A smoker’s heart beats 30 percent faster than a non-smoker’s does. This means smoker’s hearts will work harder to circulate blood throughout your system. The increased heart rate raises blood pressure as well. This is because your blood vessels are narrowed when you smoke. Because of your restricted blood flow, your muscles won’t get enough oxygen-rich blood. This means you’ll hit an anaerobic state (when you have muscles burning from strain and producing lactic acid) much faster, thus a reduced endurance. When you inhale cigarette smoke, you inhale carbon monoxide, which binds to the hemoglobin in blood, and hinders oxygen transportation. Your lungs natural cleansing abilities are hindered from the tar that collects in your airways. With your lungs underperforming, your muscles won’t get enough oxygen. This will reduce your performance and endurance, thus making those last few reps feel impossible. With less endurance, you won’t push yourself and therefore smoking and bodybuilding will keep you from getting the muscle you are looking for. Testosterone levels are directly linked to the amount of muscle you build. There are receptors on your muscles, called androgen receptors, for your testosterone. Muscle fibers are maintained when testosterone is bound to the receptors. Muscle is degraded without testosterone because maintenance stops. 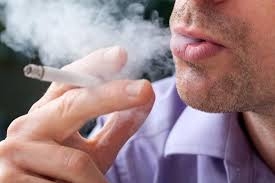 Smoking damages cells that are responsible for testosterone production in the body. As testosterone decreases, muscles start to turn to fat in areas you don’t want them to, such as the stomach and chest. According to Current Diabetes Review, low testosterone can increase fat deposits, especially in the belly. Without testosterone, estrogen takes charge. This puts fat in the least desirable places, such as your belly and chest. Smokers are also found to be more insulin resistant, which can cause problems with muscle-building goals. When you eat foods that are rich in cars, the hormone insulin is released, signaling your muscles to get the glucose floating in your blood stream. After meals, glucose is released, which produces ATP energy for the body’s cells. If you become resistant to insulin, your muscle cells don’t pick up on the cue to absorb glucose. Your muscles will become deprived when glucose isn’t absorbed. With insulin resistance also comes fatigue. It hampers glycogen storage, which is the body’s energy reserve. Without this, your workouts will lack the intensity you are after. Nutrient absorption will also be negatively impacted from insulin resistance. This will create more fat deposits in areas like the stomach, which is tough for body builders. Your stress hormone, cortisol, can also be increased when you smoke, which will decrease testosterone production. Cortisol decreases protein synthesis, which is needed for muscle growth. With smoking, there is an increase in myostatin, which is a hormone that inhibits muscle growth, prevents toning and reduces muscle strength. This is another effect of smoking and bodybuilding. It is true that those that smoke will get sick more often than those who don’t. They will also have worse symptoms and be sicker longer. Everyone gets concerned about getting sick and missing the gym. Missing time working out means you will lose size gains and strength gains that you’ve worked so hard for. If you are sick more often and longer, your body will spend less time working out. The increased illness will lead to increased setbacks, therefore hindering you from reaching your bodybuilding goals. If you are a smoker, you’re going to need more sleep than your non-smoker friends. This is because smokers experience reduced sleep quality. One reason is that your body will be fighting the demands placed on it from smoking. You will also experience nicotine withdrawal while you are sleeping. If you are a non-smoker with a better-quality sleep, you will experience a higher quality of recovery, allowing you to grow muscle while you sleep. Get a date set to quit and seek a buddy to quit with you. Keep track of why and when you smoke. Try to look for things you do while smoking, such as driving or having your morning coffee. Change your routines. Place your cigarettes in a new place, smoke with a different hand, don’t multitask while smoking and keep a journal of what you think about or how you feel while smoking. Have a designated smoking area, such as outdoors. If you want a cigarette, wait a bit. Try to do something else instead of smoking at first, such as having a glass of water. Only buy one pack at a time and try switching to a brand you don’t like. Put away ashtrays and get rid of all cigarettes. Switch your routine up, especially in the morning. Don’t sit at the same spot at the kitchen table; keep busy. When you have the urge to smoke, do something else. Carry other things for your mouth such as toothpicks, candy or gum. Reward yourself for making it through the day without smoking. Try your favorite meal, movie or book. Be prepared for being more sleepy and ill-tempered. It will pass. Try to increase your exercise with walks and biking. Reinforce what is positive about quitting like money saved, health improvements and being a role model. Staying positive can help you through the process. Try to keep busy when you are craving a smoke. Look for ways to solve the problem and remind yourself smoking won’t help. Stay regular with your meals. When you are hungry, you may think you want a cigarette. Put the money you save in a jar so you can see your savings. Server responsed at: 04/24/2019 6:46 p.m.